Both smokers and non-smokers have experienced health benefits as a result of the smoking ban in Scotland, a study of bar workers has suggested. The research, funded by NHS Health Scotland and the Scottish Government, followed 190 bar staff at more than 70 pubs during a 12-month period. 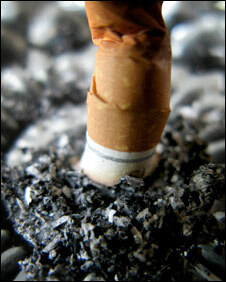 Fewer workers complained of respiratory problems one year after the 2006 ban, even among those who smoked. A fall in those with sensory symptoms, such as a sore throat, was also found. Dr Sean Semple, project manager of the Bar Workers' Health and Environment Tobacco Smoke Exposure (BHETSE) study, said the research proved the benefits of the smoking ban. The Aberdeen University lecturer said: "These findings confirm that the air quality in pubs can have an impact on respiratory health and the Scottish smoke-free legislation has resulted in improvements in the respiratory health for the majority of bar workers, smokers and non-smokers alike." The study examined workers in five areas of Scotland immediately before the ban was introduced, two months after the ban and then one year after the first measures were taken. It found the percentage of all workers reporting respiratory symptoms, such as wheezing, shortness of breath, cough and phlegm production, fell from 69% to 57%. In smokers the number reporting wheezing fell from 48% immediately before the ban to 31% a year later, while reports of irritated eyes fell from 35% to 25% in the same period. Sally Haw, senior scientific adviser at the Scottish Collaboration for Public Health Research and Policy, said the results were encouraging. She said: "The main aim of the Scottish smoking ban was to protect the health of non-smokers and findings from the national evaluation not only have demonstrated this but have exceeded our greatest expectations. "These new findings about the impact of the legislation on smokers add to the growing list of positive outcomes associated with the introduction of the Scottish smoking ban."